Interior and Exterior Architectural Photography: Interior and exterior images, incorporated with aerial images, are an especially attractive package. We have the equipment to capture daytime shots or dramatic images at dusk, to capture small rooms and large spaces. Like aerials, we'll tailor your architectural photography to meet your needs and budget. Video Editing: Aerial video, whether captured from drone, helicopter, or airplane, can be delivered quickly as-shot or edited to your specifications. Video can be edited to length to suit your presentation, graphics can be incorporated, and custom or stock music can be added. Digital Enhancement: Even if Aerialscapes captures the best possible image of your property, it may not suit your needs. 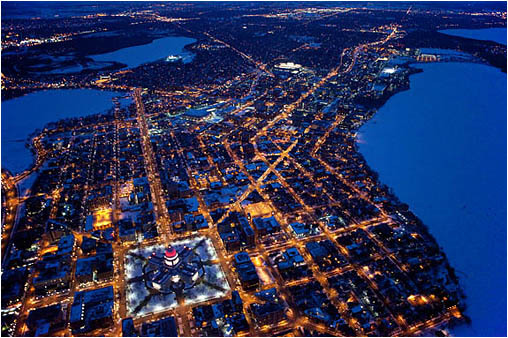 In these cases, let Aerialscapes digitally enhance your image so it does. For example, grass can be greened, cars can be added to or removed from parking lots, and building defects can be fixed. Stock Aerial Photography: You need an image immediately, the weather is not cooperating, or winter is getting in the way. These are all great scenarios for stock aerials. We routinely capture the hottest areas when conditions are great so stock can be offered to you. Areas of emphasis include downtown Chicago and neighborhoods from Evanston to Bronzeville, downtown Milwaukee and surrounding neighborhoods, and industrial development throughout the region. Referrals: As an active member in the Professional Aerial Photographer's Association, Aerialscapes is familiar with the most qualified aerial photographers in markets throughout the country. Whenever we cannot assist with your project for any reason, whether inside or outside of our normal market area, we'll be glad to refer you to the best aerial photographers that might be of service to you. Sub-Contracting / Multi-Market Coordination: When you have sites throughout the country and don't have the time to find multiple photographers, coordinate schedules, and consolidate images captured in multiple file formats and naming conventions, let Aerialscapes simplify your job by handling the entire process for you. Once you provide your locations and specifications we'll locate photographers, get quotes, arrange shoots, and receive all images. The images will then be reviewed, culled, enhanced, and delivered all with common formats and naming conventions.